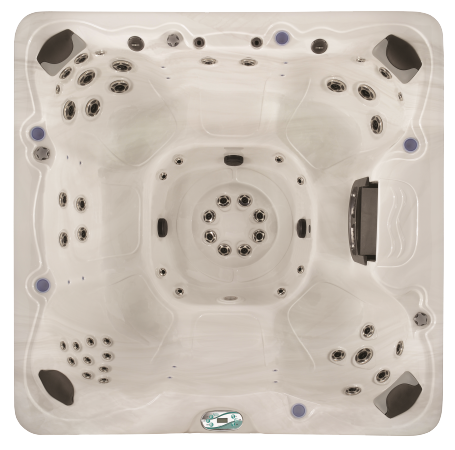 Introducing The Grand from Vita Spas, a stunning 8 foot square 7 seat hot tub with plenty of space for 7 people. The top of the range model in the 500 series, The Grand is a great solution if you are looking for a big hot tub for 8 people within a limited budget. There are four corner seat and three mid row seats, a great solution for those looking to buy a tub that can seat a large number of people within a budget. Perfect for large families and commercial uses such as for holiday cottages or for second homes, The Grand really does fill a gap in the market when it comes to comparing price with the number of seats. Alongside a 7 seater, you also get a host of added extraas such as the M7 economical and efficient heating system along side an MP3 player with a sub woofer. Combine that with 10 air jets and 53 stainless steel jets and you get great hydration at a great price. The Grand comes in a range of cabinet and interior colours and is available for delivery and installation in the South West including Devon and Cornwall from Bay Spas.